Your four-part action plan to master the reimbursement process. For the better part of the last 40 years, Limoli & Associates has been focused on the most challenging issues concerning insurance reimbursement in the dental office. All too often, challenges originally appear to be rooted in and by some form of an outside reimbursement complication. As most are well aware, the many facets of the dental market respond to both the economy and its reflective technologies. In the questionable uncertainty of this ever-changing political reality, let me share with you what I see, as well as the perspective of my clients and their immediate markets. First off, the patient’s dental insurance (or, more accurately, benefit plan) is not going away. It will continue to change in both scope, as well as function – but it is not going away anytime soon. How is it that now more than ever, both employer-sponsored as well as individual insurances seem to be dictating the patient’s course of treatment? If it’s not covered by the plan, the patient just doesn’t want to proceed. And to top it off, they are emotionally being driven to only seek needed, as well as elective, care from in-network providers. This situation is not just happening in your office – it’s all over the country – and it’s not going to get better on its own. Don’t suffer in silence as your administrative costs continue to climb. Get the direction, assistance and resources on your side that has the proven history of mastering the overall reimbursement process. I learned years ago that dentistry, as a profession, does not have insurance challenges – the problem is somewhere else and the symptoms of that greater problem show up in the insurance. That is why the comprehensive Limoli Approach is a combination of products, reporting, and customized implementation based upon the specific unique circumstances – as no two situations or clients are exactly alike. Remember, information without implementation does not apply itself to daily challenges. Without deliberate and intentional action, there is, and will be, no change. The problem persists and will again show up but with greater and often more labor intensive consequences. This is a call to take action. Take a look at your practice, sit back for a moment and observe. If you have your answer and it’s not positive, or your gut is telling you something is off, then take the first step. I am here to help you. I am most honored to share with you my continually updated experiences. Again, let me help you remove the politics of reimbursement and redirect your valuable efforts and focus back where they belong – taking care of the patients while making dentistry affordable for millions through education and information. 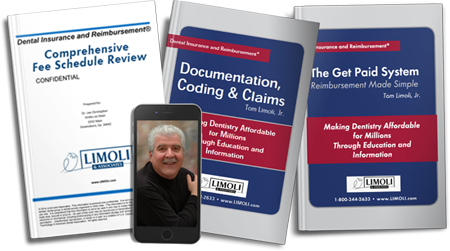 Purchase The Limoli Approach and save over $150.00! Part 1: Put and keep the patient’s insurance in its place. When patients tell you “all they want is what insurance pays for,” that is a symptom of a much more complex problem. The problem won’t ever be able to fix itself. It will and does get worse. My proven Get Paid System gives you the tools to help put and keep the patient’s insurance in its place. Purchase Get Paid separately. Part 2: Charge a fee that is fair, balanced and consistent. It’s frustrating when patients don’t accept treatment but it’s insulting when they seem to question the reality of your fees. When fee data is coming from only one source, you are not getting the complete picture. Accountants, supply houses and throwaway magazines have all given away free fee information. Ever wonder why it’s free or if it’s even realistic for your specific office? At Limoli and Associates, we have been tracking, analyzing and reporting fee data since the early days of both the Ford and Carter administrations. My fee analysis service is the most comprehensively accurate in the industry. Purchase Fee Analysis separately. Part 3: Code “at the right time” for the correct completed procedure. Coding is simple when documentation supports the findings, recommendations and actions of the clinical team. Comprehensive billing and its subsequent reimbursement are but a mirror reflection of the doctor’s eyes, hands and professional judgment. Procedure coding is not a game or series of so called strategies – I wrote the original book on procedure coding and payment logic before Current Dental Terminology was even an idea and the Code on Dental Procedure and Nomenclature was free in the ADA Journal. Stay up to date with my current Documentation, Coding and Claim Submission Package. Purchase Coding Manual separately. Part 4: Pull the clinical, administrative, and management teams together. Now, let’s bring in all the pieces. Gather your questions, issues, challenges and frustrations so they can be answered and addressed individually and comprehensively. Something you just can’t get done in a room filled with 300 other people. I personally meet via phone or webinar weekly, monthly, or quarterly. In some cases, I meet daily with offices in crises, as well as developmental growth. Communication and action planning makes change grow into reality. Schedule your Individual Consultation time. Purchase One-On-One Consulting separately.